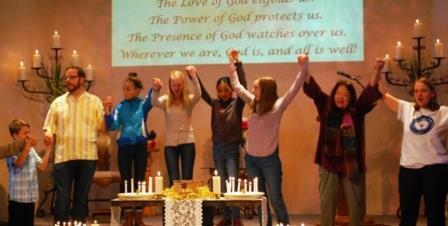 The youth ministry program at Unity Santa Fe focuses on exploring Unity principles and spiritual teachings in a fun and engaging environment. The youth are taught in a multi-age classroom using “a living curriculum” philosophy which honors the wisdom in each of them. Our lessons relate to issues that are relevant to young people’s lives and seek to guide them toward their own experience of God and a spiritual connection between themselves, God and others. Sunday lessons focus on reinforcing the idea that God is within us, around us, everywhere present and that we are loved unconditionally. Lessons are drawn from a variety of sacred writings and contemporary children’s stories that encourage the children to connect with their inner wisdom and to live the Truth they know. We also begin to establish a basic practice of prayer and meditation. Our older youth (grades 6th thru 12th) also have opportunities to engage in service work and attend spiritual events called Unitreats and Rallies where they meet other Unity teens from our region. Additionally, we invite members of the congregation to share their special talents and knowledge with the youth, such as laughter yoga, knitting, drumming circles, walking the labyrinth or exploring the medicine wheel. 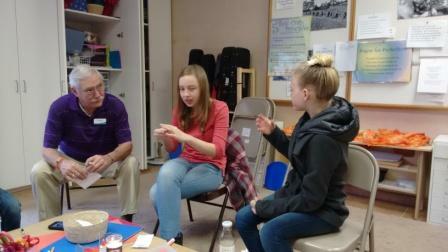 Our Youth program is supported by a team of dedicated volunteers who lovingly and enthusiastically celebrate each child’s spiritual journey.